It seems after their successful 2014 tour with Adam Lambert to Australia, Queen have realised we still exist down here!! 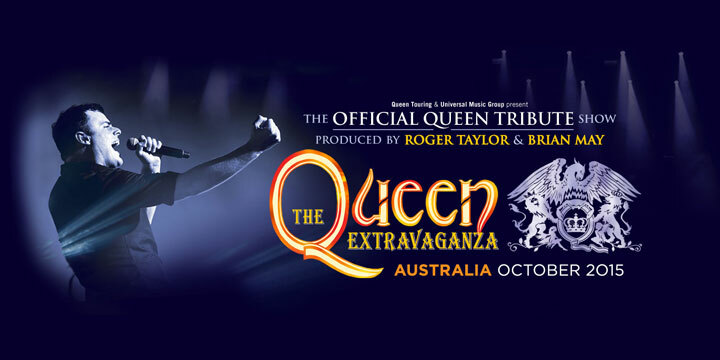 Coming to the Gold Coast, Sydney, Melbourne, and Perth in October: The Queen Extravaganza! JUST ANNOUNCED: FOR THE FIRST TIME IN AUSTRALIA - THE QUEEN EXTRAVAGANZA! The Roger Taylor and Brian May produced Queen Extravaganza will rock Australia this October with shows on the Gold Coast, Sydney, Melbourne and Perth. The Queen Extravaganza is a spectacular touring concert show designed to take the glorious music and live experience of legendary rock band Queen and bring it to generations of fans. Two of Queen’s original band mates and songwriters— iconic drummer Roger Taylor and legendary guitarist Brian May—are the masterminds behind The Queen Extravaganza. “The Queen Extravaganza is a brand new show specially designed to enable new fans, together with fans of old, to celebrate the music of Queen in a heart-stopping event", says Taylor. “It’s very spectacular, it’s very visual, there are going to be some shocks and some tremendous surprises. It will be a rock celebration in the Royal tradition.” Taylor personally has taken on the role of producer with long time Queen Keyboardist Spike Edney as global music director. Together Taylor and Edney have created the ultimate Queen concert experience in an electrifying road show, which celebrates the band’s music and legacy as performed by a new generation of musical talent. The band is: vocalist Marc Martel; guitarist Nick Radcliffe; drummer Tyler Warren; and bassist Francois-Oliver Doyon. "This band is now so frighteningly good, I would hate to have to follow them on stage," explains Taylor. The 90-minute show features more than 20 Queen classics drawn from the band’s biggest hits: “Bohemian Rhapsody,” “Another One Bites the Dust,” “Crazy Little Thing Called Love,” “Under Pressure,” “We Will Rock You/We Are the Champions,” “A Kind of Magic,” “Radio Ga Ga,” “Somebody to Love,” and “Killer Queen” as well as other fan favourites. The production will be enhanced visually with rare video footage from Queen’s extensive archives and also newly created imagery. Tickets & Official VIP Packages go on sale to the general public at 10am local time on Friday 1st May. I hope the tickets will sell well and there will be more dates added! I'm hoping so too. Their four dates (so far) are on Saturdays and Tuesdays ... that leaves a few days in between each show in which to add another one each if need be. Gotta feel for those people in Adelaide though. They were the only 'major' capital city in the country not to get Queen + Adam Lambert last year, and now they miss out on the QE tribute show too. Either way, I'll be rounding up a crew of people this week and will be getting my tickets to the Perth gig very soon! There must not be anyone in that area there yet! Do the australians still live in the stoneage? From all the other tours there has been tons of youtube videos from their gigs. So far there is nothing. Isnt that a bit strange? Another_Roger wrote: Do the australians still live in the stoneage? From all the other tours there has been tons of youtube videos from their gigs. So far there is nothing. Isnt that a bit strange? Someone uploaded about a 45 second clip of BoRhap. on the Int. Queen Fanclub fb page yesterday. That's it. I replied with my appreciation and implored whoever else was seeing them to please send some complete videos to youtube. Even the one I saw was uploaded directly to fb, not youtube. Brandon is not on this tour, on keyboard. Usually QE takes priority over any other engagement he has, even when he was in WWRY U.S., but not this time. They have a sub. Nah mate, definitely not in the stoneage here. We basically live in a nanny state, where security, police, decision-makers make sure crowds are manageable. Venues ban cameras, make sure anyone up and dancing at concerts sit down so that everyone behind them can see, ect. I think it all comes from the proverbial 'bad apple'. The one person out of a thousand that will do the wrong thing has ruined it for everyone else. I love Australia. Greatest place and people on Earth (yes, I'm biased, I'll admit! ), but the 'fun police' frustrate the hell out of me, and it's only getting worse. I suppose, also, we're pretty starved down here of official Queen live events, so when the opportunity comes up for us to see them (Q+AL, QE, ect), we're more likely to make the most out of going and enjoying the gig/s instead of videoing them for the benefit of people on the internet. Just a couple of theories of mine, for what they're worth. agkelly wrote: Nah mate, definitely not in the stoneage here. We basically live in a nanny state, where security, police, decision-makers make sure crowds are manageable. Venues ban cameras, make sure anyone up and dancing at concerts sit down so that everyone behind them can see, ect. I think it all comes from the proverbial 'bad apple'. The one person out of a thousand that will do the wrong thing has ruined it for everyone else. I tought they were good theories. Quite understandable from your point of view. Australian's think differently when it comes to watching youtube concert videos, I am finding. I just checked the demographics to see how many from your country viewed my top played QE video from 2012 and your country didn't make it into the top 10 of over 10,000 views. Japan was at #10. I didn't take the time to pull up the whole list. I was suprised in the beginning, seeing there were people in more than 23 countries looking at it. Some of us don't just think of it as benefiting the people on the internet though. Recording it firsthand for ourselves, especially when some of us don't have the memory we used to, and know that said memory isn't getting any better. Secondhand, for the benefit of Queen Extravaganza that as many folks as possible get a chance to see how fantastic they are. And thirdhand, it's just a nice thing to do for those that can't get to where the shows are. It's all good though. The UK folks did pretty darn good!